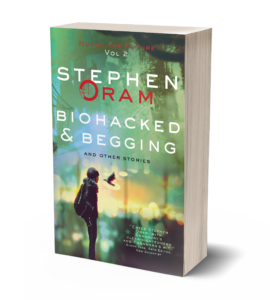 When indie author Stephen Oram started out, he realized he had to establish a clear point of difference about his work to make his mark in a crowded market. 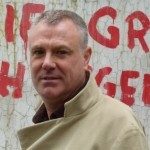 Homing in on opportunities relevant to his specific genre, he has since cleverly carved himself a specialist niche in near-future fiction via collaborative events with scientists who are developing the technology of the future that he is writing about. Man writes book is not particularly interesting or newsworthy. This really got under my skin and pushed me hard to think about whether I could stand out from the crowd, and that’s what I’d like to talk about in this blog post. I’ve written it as a personal story rather than a ‘how to’ guide because that’s pretty much the point of what I’m saying. So, please take it in that spirit and make of it what you will. ‘Man writes book’ was in the back of my mind when I shared a stage with some historical fiction authors. They had so much knowledge and information from their research that the background to their writing was almost as interesting as the writing itself. I have to admit, that as they engaged the audience in tales and facts from the past, I had less than generous thoughts about how easy it was for them. I pondered on how to be more than the man who wrote a book and came to the conclusion that not only did I need content, I also needed credibility and a community. Naturally, I turned to my own genre to look for inspiration, but couldn’t find what I was looking for, although now I do know where to find it. In the absence of discovering an attainable role model in the world of sci-fi, I took as much inspiration as I could from around me. Knowing there would be no point in simply copying the historical fiction crew, I was sure there was something to learn from them. After all, I did research and there’s a lot of interesting stuff behind science fiction. 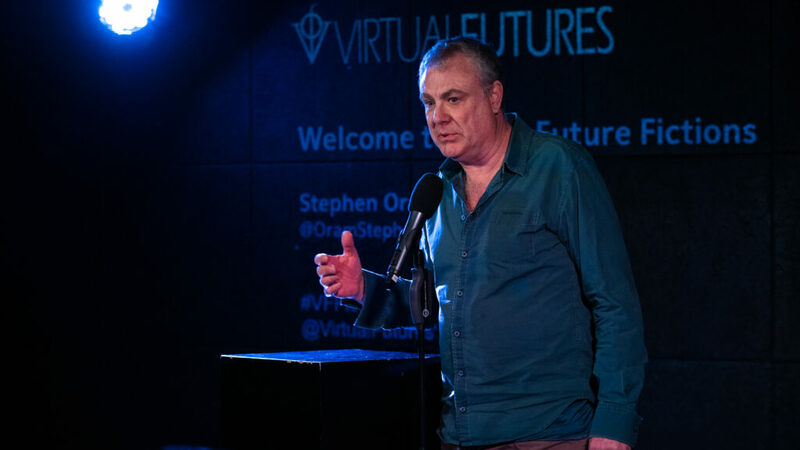 That’s when I was offered the role of writer-in-residence at Virtual Futures, which at the time was running a series of panel salons on topics such as neuro-stimulation and futuristic prosthetics. These were the sort of topics I was interested in, and so I agreed to write pieces of flash fiction specifically to read at the event to bridge the gap between the panel discussion and the audience Q&A. Through these salons I met social scientist Christine Aicardi from King’s College London, and a fantastic journey of collaboration with scientists and future-tech folk began. I worked with Bristol Robotics Lab, TwinsUK, King’s College London labs and the Sainsbury Wellcome Centre, and the research opportunities this has given me are incredible. Even more importantly I got to share public platforms with these wonderful scientists. My community was forming, and Eating Robots, the first collection of short fiction in the Nudge the Future series, was conceived. It’s been amazing fun and extremely mind-stretching and, of course, none of this would have been possible without that initial inspiration from the historical fiction authors and my slightly lateral leap from what they were doing to what I could do. I was also on an Artificial Intelligence panel at the Bradford Literary Festival where an audience member, uninvited and with some force, read extracts from Revelations at me. During this journey I took a course led by Joanna Penn and Orna Ross on “How to Make a Living (and a Life) from Writing.” Once again, inspiration was offered and once again I worked out how to make it my own. Now I see the world slightly differently and keep an eye out for paying opportunities. Many fascinating collaborative and funded projects have come along, and the great thing is that I’ve not had to compromise on what I do, just shift my mind-set a little. For example, as part of the Furtherfield Citizens SciFi project I’ll be working with scientists, future-tech architects and local residents to celebrate 150 years of Finsbury Park, London by writing a short story set in its imagined future. I’m also a member of the SciFutures panel of writers, getting paid to write short pieces for multi-national corporates to help design their fifty year strategies through scifi-prototyping. None of this is what I expected to be doing when I began writing. All of this may seem like a long list of happy coincidences and self-congratulatory experiences. It’s not meant to be. What I’m hoping you’ll take away from this is that for me it’s been worth observing and listening to others and then turning their successes into something that works for me. Not by copying, but by understanding why they do what they do. It’s too easy to look for a ‘success formula’, and, let’s face it, there’s no shortage of those being touted around. I certainly don’t want to make out that I’ve cracked it or that it’s been easy. Neither of those is true. For a long while I said yes to everything in the hope something would work, but now I can be more choosy. And I still have a long way to go, but it feels as if this is a good basis for the launch of my new collection, Biohacked & Begging. OVER TO YOU If you have found a way to identify and seize appropriate opportunities for your genre, as Stephen has, we’d love to hear about them!